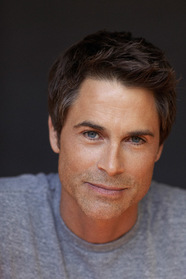 Rob Lowe began his acting career at the age of eight in local television and theater. After his family relocated to Los Angeles, Lowe began his national acting career starring in the ABC television series “A New Kind of Family.” In May 2010, Rob Lowe joined the cast of NBC’s “Parks and Recreation” where he plays the role of Chris Traeger. His recent television work also includes a three-episode appearance on Showtime’s “Californication,” in which Lowe plays unpredictable, megawatt movie star Eddie Nero.Preceding his move to “Parks and Recreation,” Lowe stared in the ABC-TV hit series “Brothers & Sisters.”.Additionally, for four seasons (from 1999 – 2003) Lowe starred as Sam Seaborn on Hit NBC drama “The West Wing.” His performance in the show garnered Lowe an Emmy nomination, as well as two Golden Globe nominations for Outstanding Lead Actor in a Drama Series. He was nominated three times for the Screen Actors Guild award, winning twice. In September of 2005 Lowe made his West End debut starring in Aaron Sorkin’s “A Few Good Men”, receiving rave reviews at the Royal Haymarket Theatre in London. In 2006, Lowe starred in the hit satire “Thank You for Smoking”.In Spring of 2011 Rob Lowe added author to his credits with the release of his very first memoir Stories I Only Tell my Friend: An Autobiography. Complete with adolescent anecdotes, Rob Lowe shares astoundingly personable excerpts as he recalls his encounters, experiences, and the audition that changed his life forever. Listen to actor Rob Lowe read from his memoir Stories I Only Tell My Friends. In this audiobook excerpt, he talks about his friendship with John F. Kennedy, Jr.